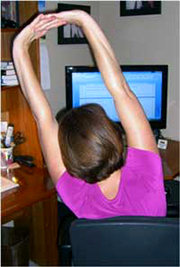 Work place Wellness is designed to support healthy behavior in the workplace and to improve employee health outcomes. Health fairs, health education, health coaching, weight management programs, smoking cessation, employee assistance programs, wellness newsletters, fitness programs and educational programs are some of what is available. The ultimate goal is to create a “healthy culture” within the work place. Ergo Life Solutions will conduct a formal assessment to determine Wellness programming needs in your organization. We will work with your organization to develop wellness teams, and provide training for implementation of Wellness programming. Stress management training and techniques for supervisor or staff level employees. Services offered for small or large groups. Communication techniques can lead to the success or failure of an office. Ergo Life Solutions will provide training to incorporate techniques for effective workplace communication. Ergo Life Solutions will collaborate with established smoking cessation organizations to implement appropriate programs for your organization. Ergo Life Solutions will collaborate with established community and health insurance companies, or create integrative on-site wellness programming into your organization. If not addressed, pain and discomfort will ultimately lead to permanent disability. The key to a successful wellness program is to break the pain cycle early on. Ergo Life Solutions does that by providing immediate solutions! 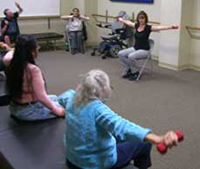 Barb providing a fitness class. Barb providing a stretching training.